On November 19, 1968, my mother, her friend Madeline and I were out for the day. Well, they were out and about for the day and I was dragged along because, like any 7 year old, I had no choice in the matter. The M&M’s, Mom & Madeline, sat on the front seat of Mom’s white Chevy Impala, with my mother’s usual death grip on the steering wheel. I lodged myself just below the lone radio speaker awkwardly implanted in the middle of the back seat. Every time she’d hit a pothole the back of my head would bounce on the hard plastic speaker casing and I would just giggle to myself. That explains a lot if you think about it… I wasn’t wearing a seat belt because it was the 60’s and seat belts were more decorative than anything else in those days. It was a unique era. Smoking was still oh-so-very-cool, cat-eye glasses were all the rage, Adorn Hair Spray was best bought in bulk and seat belts were just a quaint fad that would go, one would assume, the way of Stretch Armstrong and the Kodak Flash Cube. Jeez, I’m showing my age. One of the Kniceley kids, over the course of the evening, gave me a silly football player doll-like-thing. It was about 9” tall, lean & lanky with totally flat feet. It was encased in a soft cloth uniform supported by a flimsy internal wire skeletal frame which allowed me to bend him into absurd positions, sort of like Gumby. It couldn’t stand on its own. I don’t even remember why they gave it to me. I assume they found it as useless as I did, so they dumped it onto some unsuspecting kid. In the early hours of the next day, November 20, the Farmington #9 Mine blew up. It was worst mine disaster in the state and one of the worst in the country. The explosion was felt where I lived, in a town about 12 miles away. I remember our house shaking in the wake of the blast, the windows rattling in unison. 99 miners were initially inside. They managed to rescue 21 but 78 were lost. Mr. Kniceley was one of those who perished. This tragedy occurred in 1968 but his body was not recovered until 1972. There are approximately 19 still entombed in the old shafts. 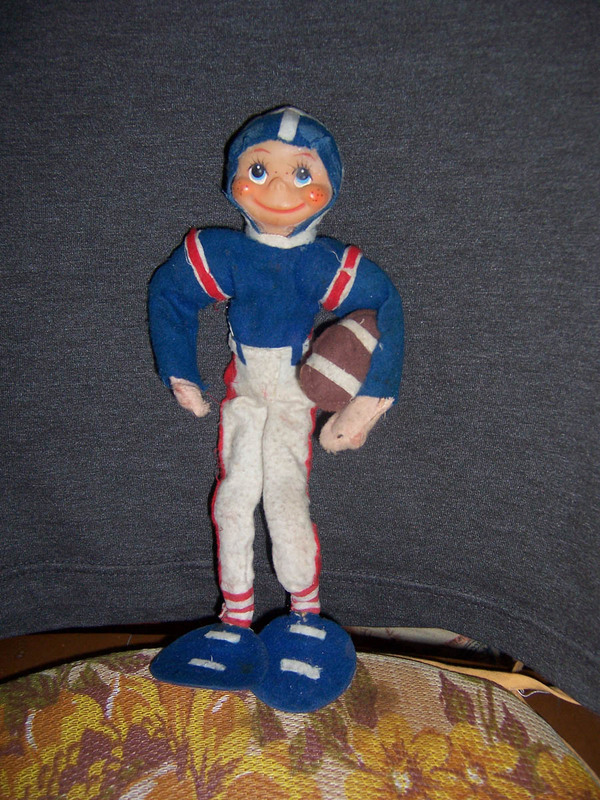 I still have that football player doll. I would never want to part with it. That moment in time truly hit me hard. I only saw the man for a brief minute but I can still remember him in vivid detail. Whenever I hear of a mine disaster anywhere in the world my mind flashes back to that night and that man. The speed in which a life can be taken is a solemn reminder of the brevity of it all. Life can be staggering and overwhelming at times. No doubt about that. We have to remember that, no matter what, life is a precious gift. It may not always seem that way, of course. There are days when you’re handed a stupid football figure but, when some time passes, you realize it can still be cherished even among the tragedies. My recommendation? Embrace it all.